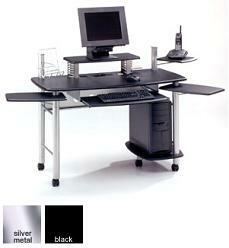 This OFM 52902 home office furniture model replaces the Model 52002 Computer Work Center. Construction material consists of painted tubular steel with protective coating and scratch-resistant MDF surfaces. Dedicated shelf accommodates most CPU towers. Full size keyboard pullout with room for a mouse pad. Removable large monitor shelf with integrated CD-ROM storage slots. Swing-out telephone pad, document holder, and integrated accessory grooves. Swing-out shelves create additional working surfaces. Wire management system. This product comes ready-to-assemble with easy-to-follow trilingual assembly instructions, carefully packaged in one box. Constructed of the finest available materials. This modern style computer deskworks great as a home computer desk or an office computer desk!
? CPU tower shelf 10"x22"
? Overall height is 35 1/4"
? Overall width is 90 1/2"